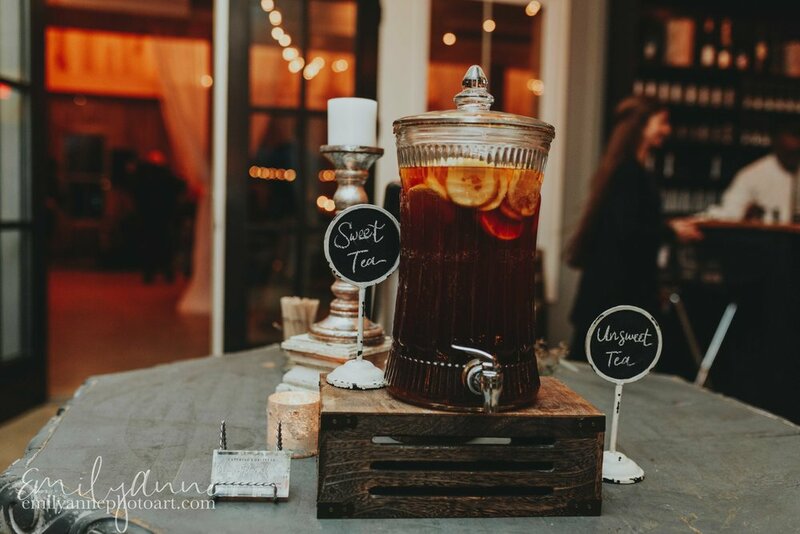 Nashville wedding photographer and senior portrait photographer Emily Anne's Photo Art (photographic services) captures and documents the beautiful images she takes along with writing. Only the BEST will do! 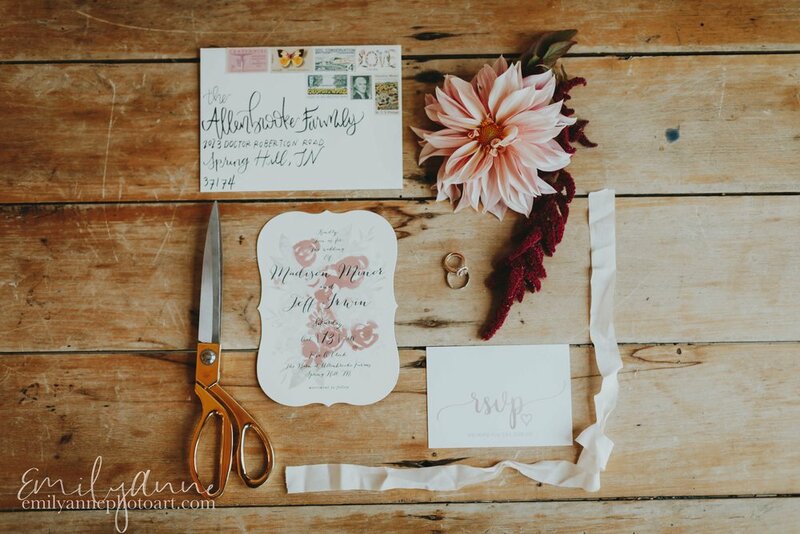 Madison + Jeff wed on a gorgeous October day at rustic venue The Barn at Allenbrooke Farms. Though they are both from different corners of the States, they met shortly after both had moved to Nashville. 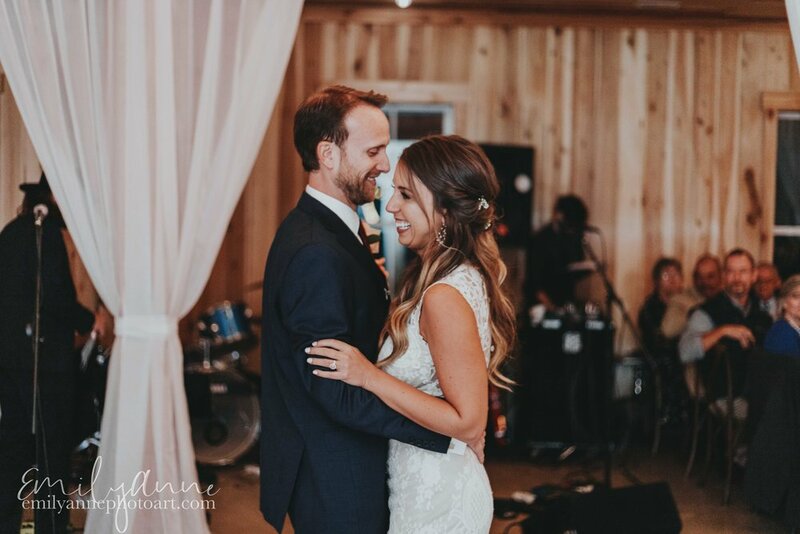 Tennessee was the perfect place to make their vows on their special day. 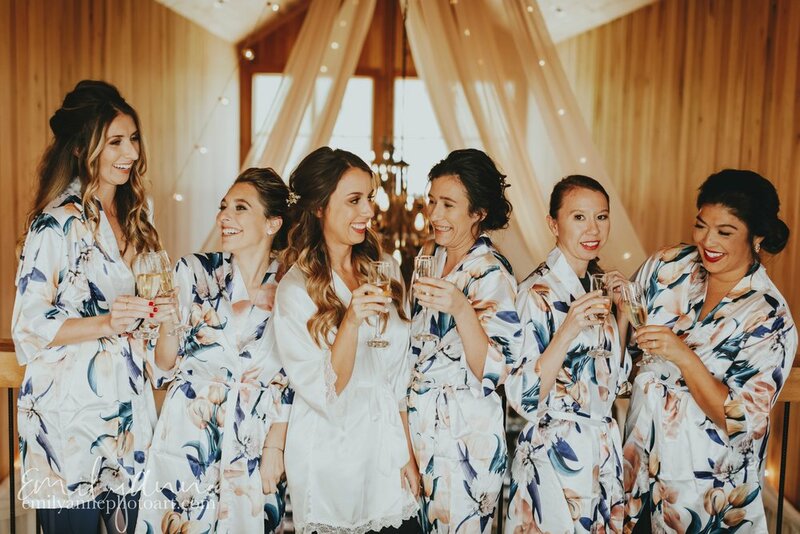 Madison was a beautiful Bohemian bride and looked absolutely stunning in her soft, romantic gown. This couple are a match made in heaven! 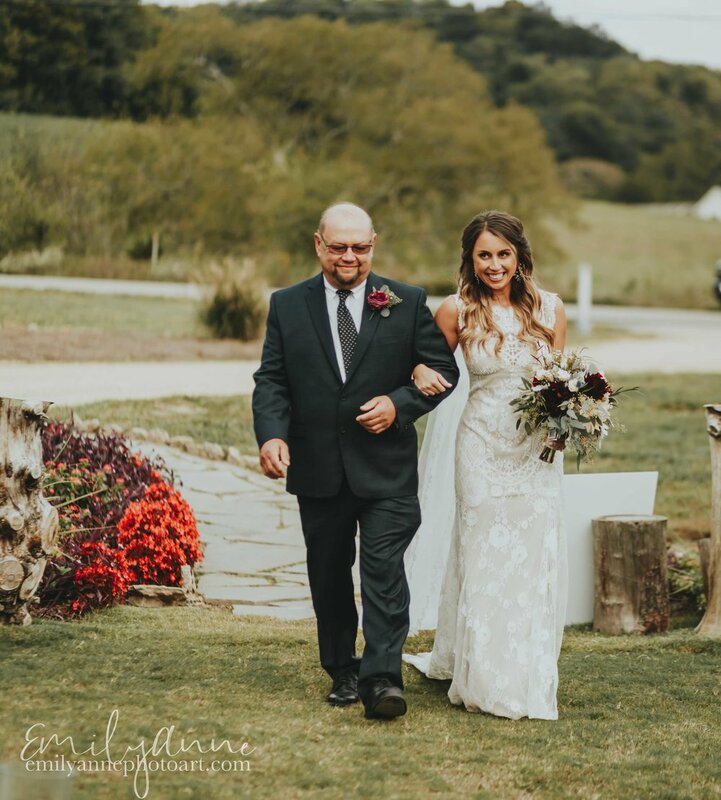 Allenbrooke Farms did a phenomenal job hosting + coordinating for this gorgeous couple, and helped make their simple + natural wedding dreams come true! 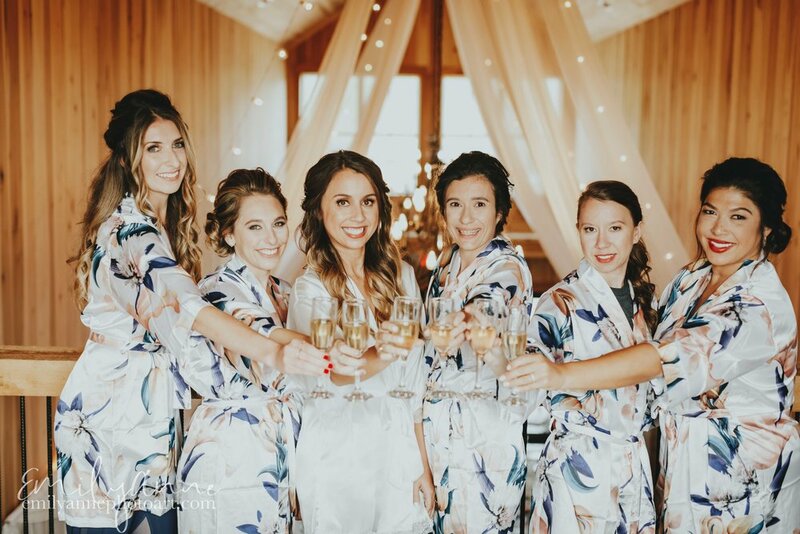 Madison wore a fitted, short sleeve lace wedding gown by Claire Pettibone. The Bohemian design complimented Madison’s free-spirit and looked absolutely glamorous on her! 931 Beauty Co and Go Gorgeous tag teamed her hair and make up to complete the look- so elegant! 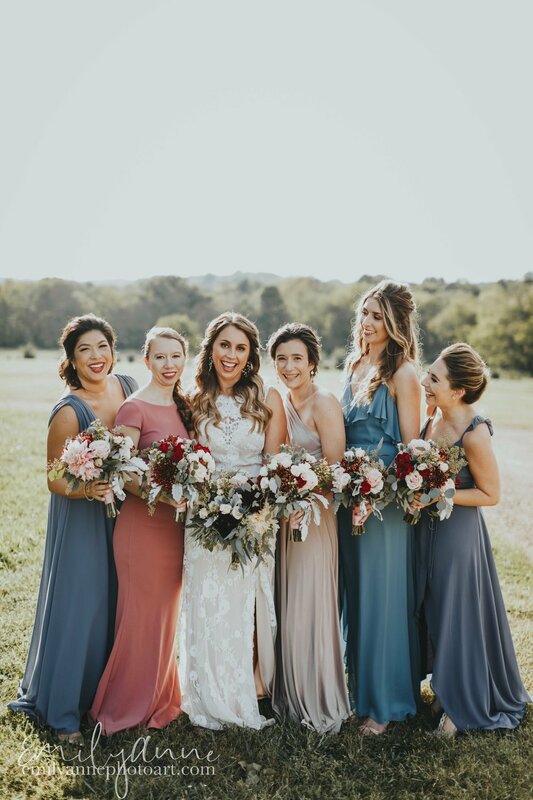 The ladies in Madison’s bridal party looked elegant in mismatched muted bridesmaid dresses. 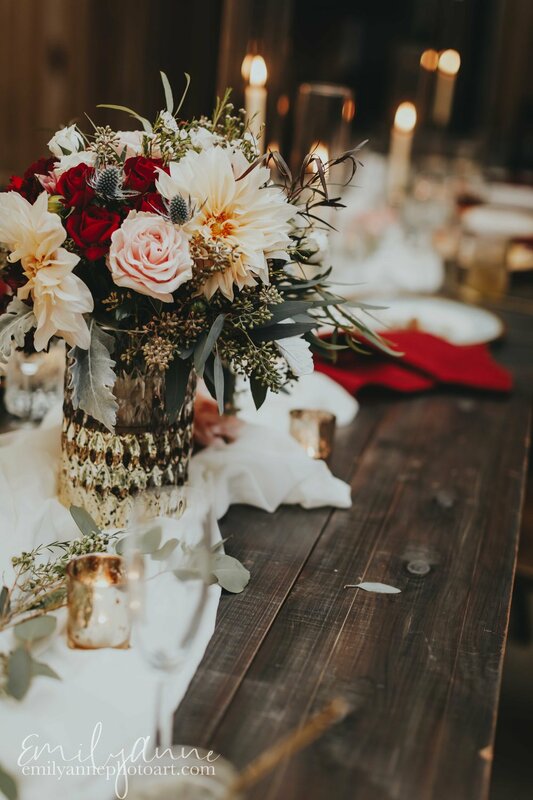 Their gorgeous bouquets by Belles Fleurs tied the whole ensemble together with an autumn flair. These florals are the perfect finishing touch! 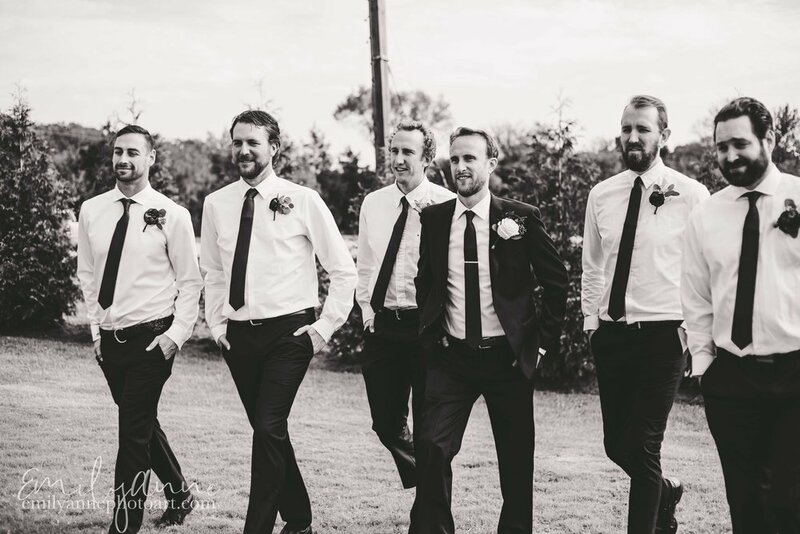 Jeff and his guys looked pretty dapper in their navy suits and maroon ties. ZZ Top definitely had it right- “Every girl’s crazy ‘bout a sharp dressed man”! 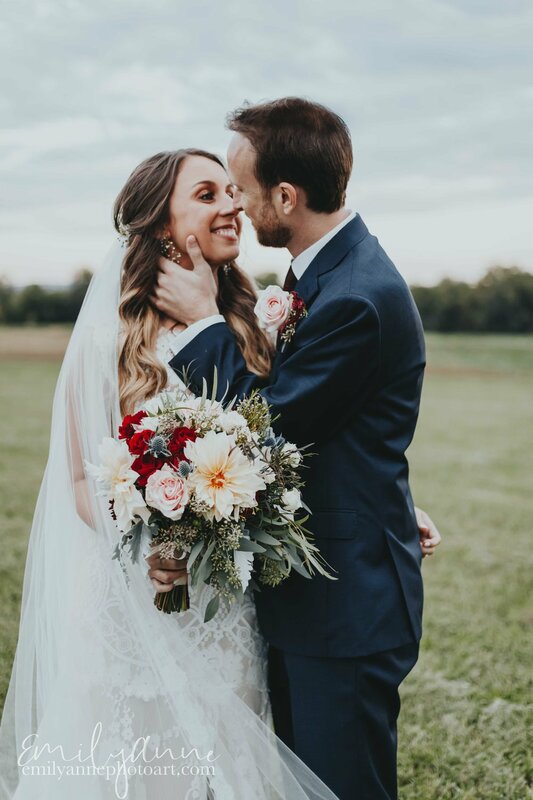 Congratulations Madison + Jeff!! May you have many happy years to come! 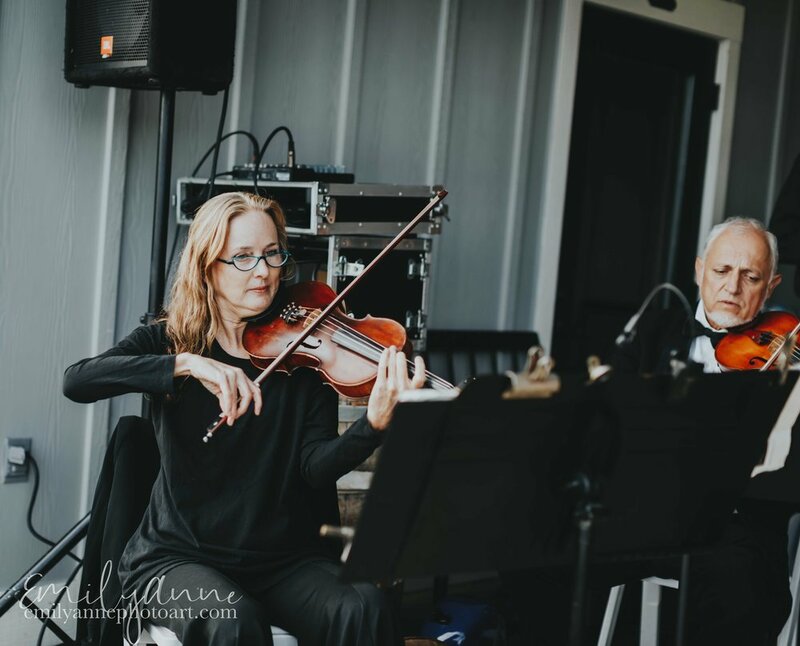 Here is a lovely sneak peek of Steven & McKenzie’s stunning classic wedding at the gorgeous rustic venue Allenbrooke Farms in Spring Hill Tennessee. Doesn’t it look like something straight out of Pride and Prejudice with the foggy overcast soft tones?! I most certainly think so! I am the happiest creature in the world. Perhaps other people have said so before, but not one with such justice. I am happier even than Jane; she only smiles, I laugh. Isn’t this cake just purely decadent!? I absolutely love it!! <3 And the flowers add such an elegant yet soft classic touch to the cream cheese frosting. 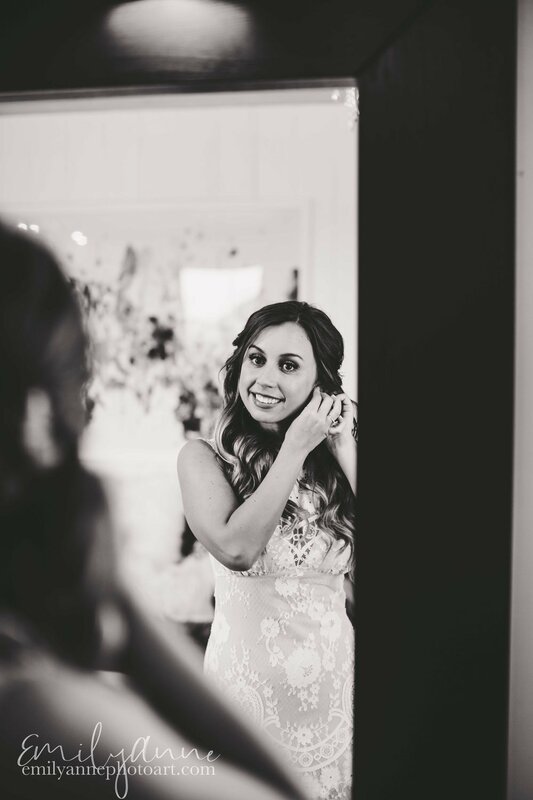 Beautiful Mckenzie, isn’t she absolutely a radiant bride!? Positively glowing ready to marry the love of her life! 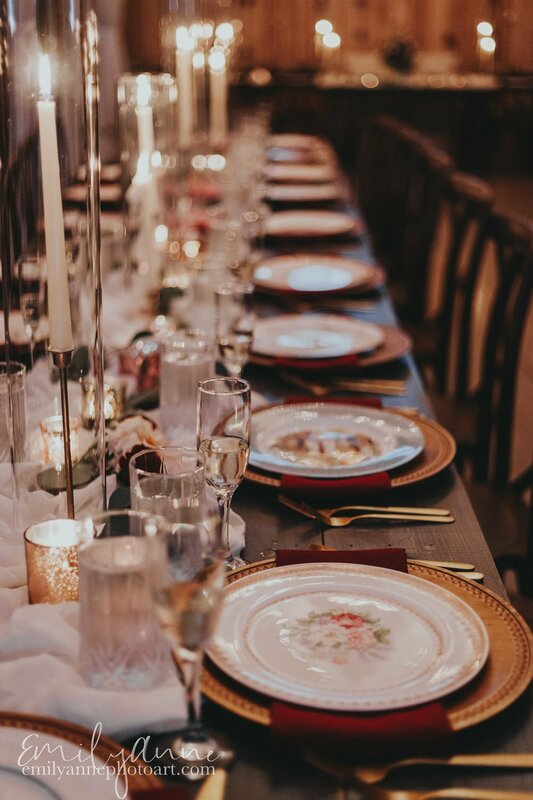 I absolutely this trendy wedding color scheme —- the dark rich reds and blues along with vibrants and shades of neutral greens and earthy wood are timeless. Downtown Franklin was the best location for this gorgeous photo shoot with senior Skiles! We had so much fun finding the top nooks and crannies to create the most beautiful portraits. Skiles’ did an excellent job and the photos turned out AMAZING. I mean, just look at this natural model! Skiles’ Waggener is a senior at Ravenwood High School in the Nashville area. When she’s not killing it on the volleyball court, she’s involved in her church theatre group! It’s no wonder she’s great behind a camera! Skiles’ shoot was absolutely breathtaking, with gorgeous sunlight and textured walls, making it an urban + nature blend success! 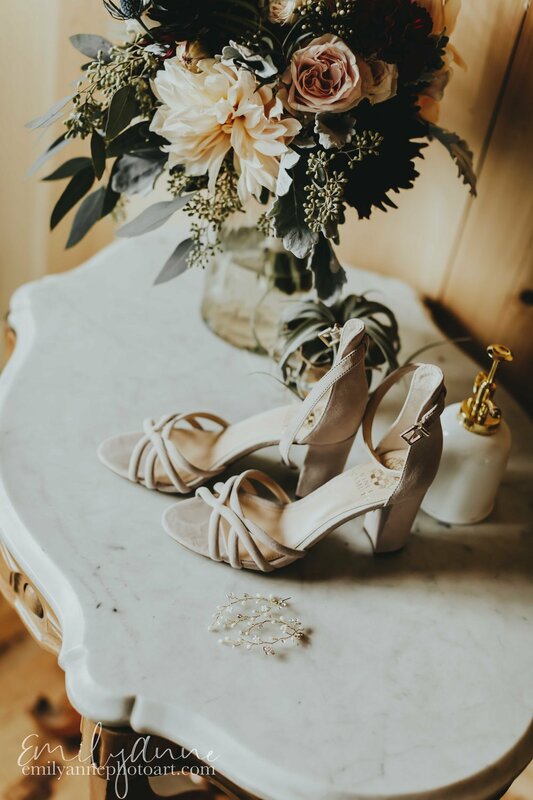 Portrait Photographer Emily Anne uses natural lighting in her photography style, creating an authentic and life-like image. 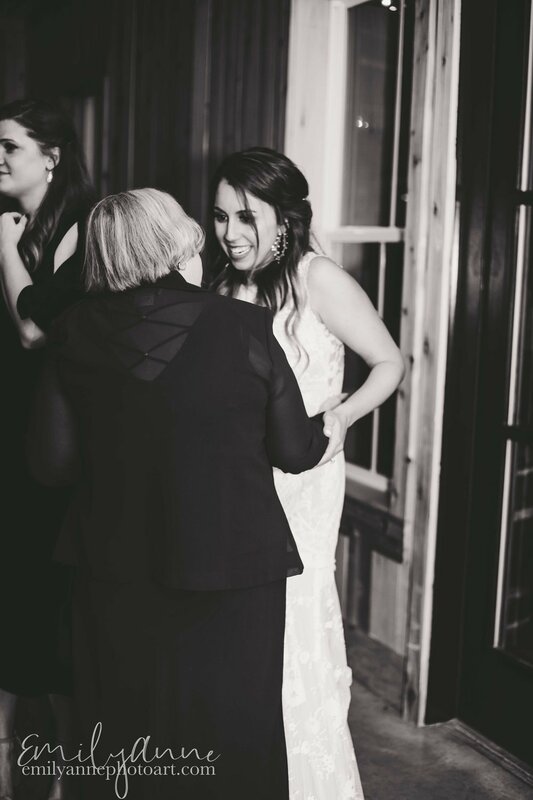 Skiles’ was absolutely radiant in the this natural setting- look at her glow! As Estée Lauder said, “Confidence breeds beauty”. Skiles’ floored us with her confidence and ability to be truly herself on camera. She was such a joy to photography, and we are so excited for all that she will set out to do! Montserrat is a multi-peaked rocky mountain range located near the city of Barcelona in Catalonia, Spain. The largest most beautiful peaks are Sant Jeroni, Montgrós, and Miranda de les Agulles. The largest peak is where this beautiful abbey called Santa Maria de Montserrat that has the most well known boy's choir & the well known statue of the Black Virgin Mary. Look at these lovely pics of the gorgeous Rhea who attends Vanderbilt University in Nashville, Tennessee and is studying through the liberal arts program in Spain! Seeing the boy's choir of Montserrat- el coro de ninos de Montserrat was a really special treat. If you go, try to go during the weekdays and they perform at 1 PM Monday through Friday. It truly felt like listening to the voices of angels. Fun fact, the most famous architect in all of Barcelona, Antoni Gaudi, modeled his famous Sagrada Familia based off this mountainous range with the unique curved shapes. I wonder if anyone has had a wedding up here? The mountain range is so beautiful it would photograph perfectly. 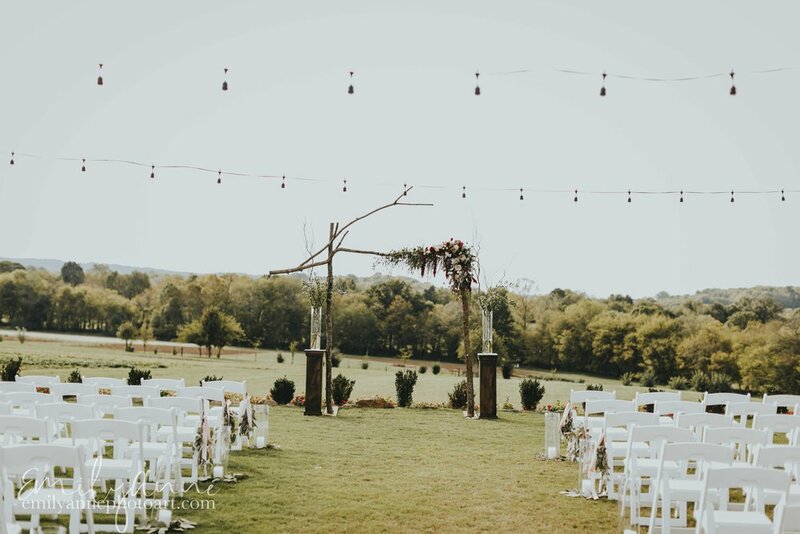 However, since it is quite the hassle to get up so high, I would assume that this would be a better place for a more intimate ceremony or elopement. There are a couple of gorgeous hiking paths & if you take the "easier" one you can walk over to this beautiful view of the mountains and viewpoint of Catalonia, you can even walk up until the cross to get the best advantage point. If you are in Barcelona for at least 3 days, I would highly recommend making this easy day trip to Montserrat from the city! The view is 1000% worth it. Thank you, CIEE for this experience. Absolutely loved this moody portrait shoot on the shores of Candelarias, Tenerife in the Canary Islands. It's so beautiful!! If you need a destination vacation spot in Europe - go to the Canary Islands. Look at this gorgeous beauty on the beach - she's got that relaxed beauty glow! Andrea is seriously such a natural in front of the camera. Also, the beaches are different on each island and since Tenerife is volcanic, most of the beaches are black rock. However, you can find sandy beaches black & white in the south and further in the northern part of the island. Forever in love with this view of palm trees & the beach & constant warm weather. 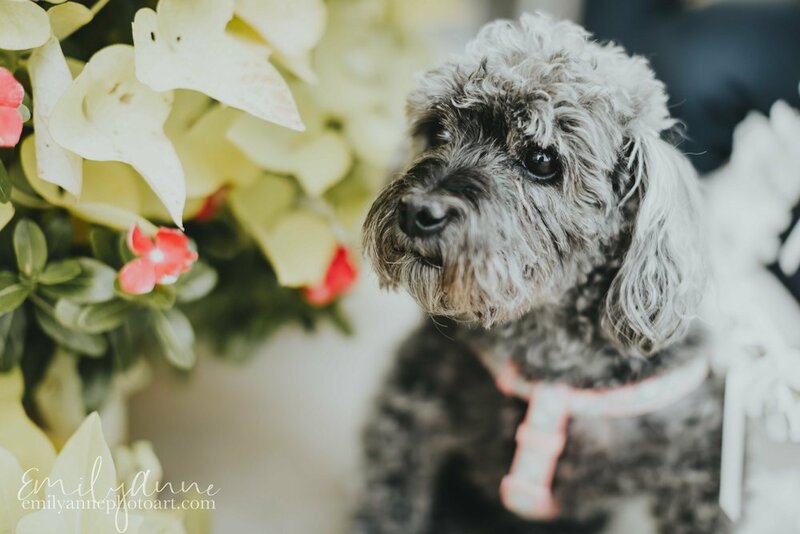 We had such a lovely time photographing the beautiful Clara! ;) She came from Knoxville to get her portraits done and she is absolutely radiant inside & out! Her outfits were super fun & she had a perfect variety of elegant, classy & urban and fun! Clara is about to graduate from West High School in Knoxville this year. Not only is she graduating Class of 2018 but she also is AMAZING and will be graduating with her IB diploma. I know how much hard work and dedication it takes to be an IB student so it is a really big deal! So fun doing her some of her images inside Frothy Monkey in Downtown Franklin. She's the absolute cutest. Congratulations Clara on graduating and I'm so excited to see what all you do in the future - whatever you do you will excel!! Valencia is known for their paella- Spanish paella originated here, so you know they know what they're doing. This paella was honestly the best I have ever had- I don't think any other place in Europe, or in the world, for that matter could compare. Our Liberal Arts Program at CIEE had the privilege of attending the official Paella Escuela in Valencia, Spain to learn the art of cooking paella. Even though you can find paella in just about any part of the country of Spain and even around the world now, there is really an art to cooking it that the Valencians have mastered. We were given wooden spoons to be able to make our own paella one day. I do plan to attempt making Paella when I get back to Nashville but I doubt it will turn out the same. I will give it my best try though. Thank you, CIEE for this amazing opportunity! We had the privilege of going on a weekend trip to Valencia Spain through CIEE Study Abroad Program. The weekend our group went we ended up having perfect weather (as you can see) and were also able to see the Las Fallas. Everyday at 2 PM as part of the festival tradition for a month, fireworks went off in the city center plaza- some of the loudest fireworks I've ever heard, or for that matter, felt. We had a small but fantastic group all from the CIEE Liberal Arts Program for the weekend! 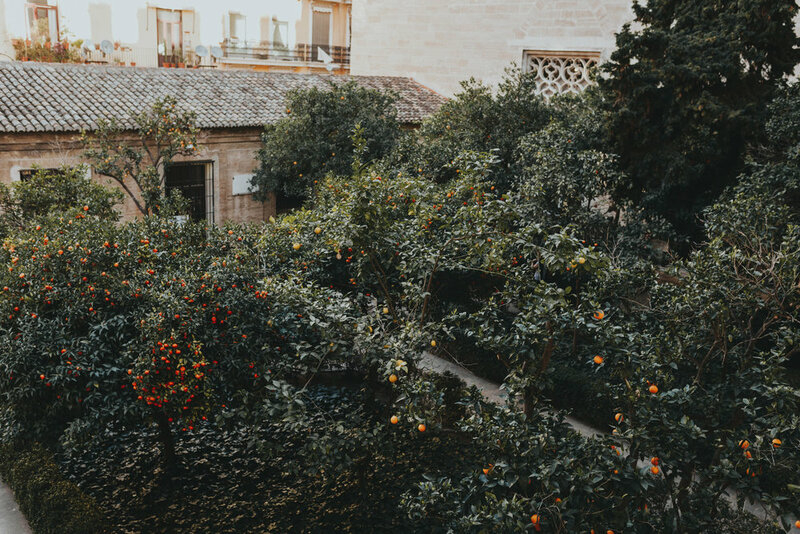 Valencia is well known for their oranges and mandarines - driving through the countryside you can see acres of orange tree groves. The architecture in Valencia is beautiful & the guided tour of Valencia was so interesting to learn the history of this popular city. If you didn't know, Valencia is the home of the Paella. We had the privilege of going to a paella school where they taught us the art of making paella - if you would like to see how to make paella- click HERE. I don't think I could ever get tired of these calming colors together: blues, whites & greens. 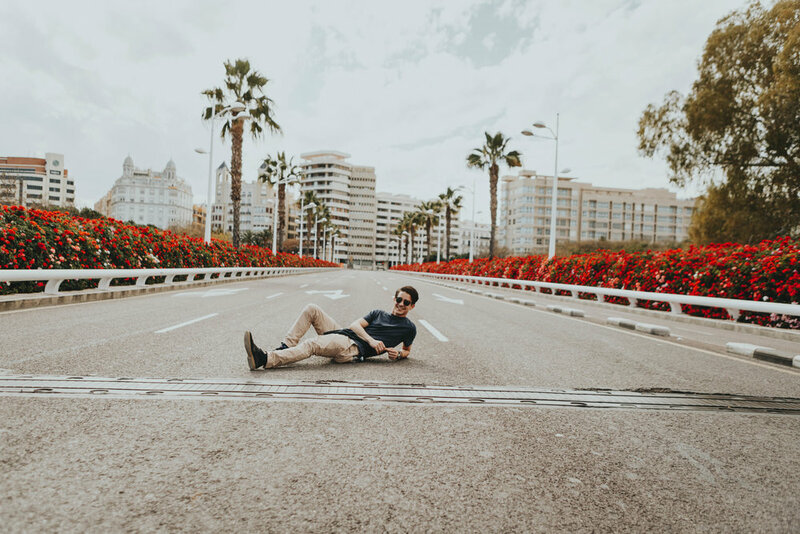 We were walking through the streets of roses and then I had a crazy idea to photograph Elliot in the middle of the street- little did I know he was going to run in the middle and lie down on the ground haha but it looked great and we snapped them just in time. Elena is the amazing program director of the Liberal Arts Program at CIEE Barcelona and she & lovely Irene lead us on the tour of Valencia for the weekend. Muchismas gracias, Elena y Irene por todo!! We had a great day exploring the beautiful park of Valencia. Will and Victor who also go to Vanderbilt University in Nashville TN- what a small world! 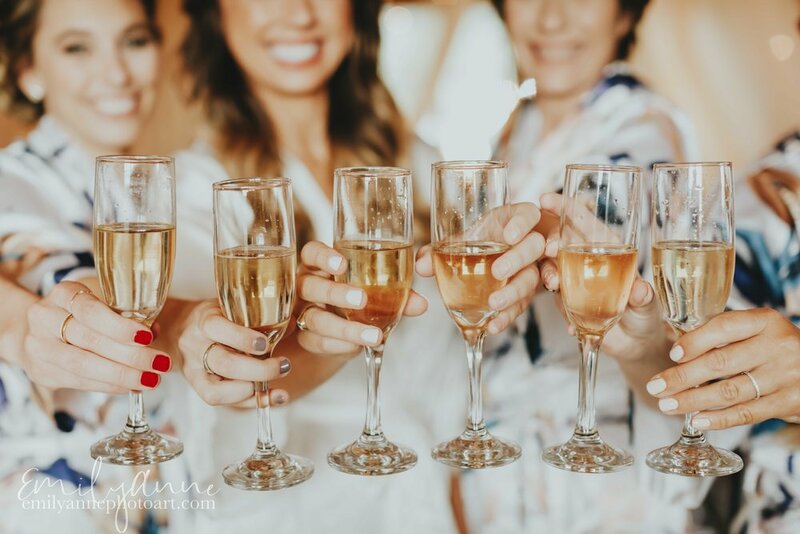 Take a look at gorgeous Alli, Emily & Megan- we had so much fun exploring the beauty Valencia. The walking street art graffiti tour was really interesting - so many murals with different artists who have made their mark & branded themselves in the city. The street art really does make the city vibrant. Also, if you live in Barcelona, Valencia is the perfect weekend getaway because it is only 3.5 hours away by car or bus. Thank you CIEE for an amazing weekend trip to Valencia, Spain! The central plaza is worth seeing alone in Brussels - absolutely gorgeous with all the gold intricate designs of the town halls. 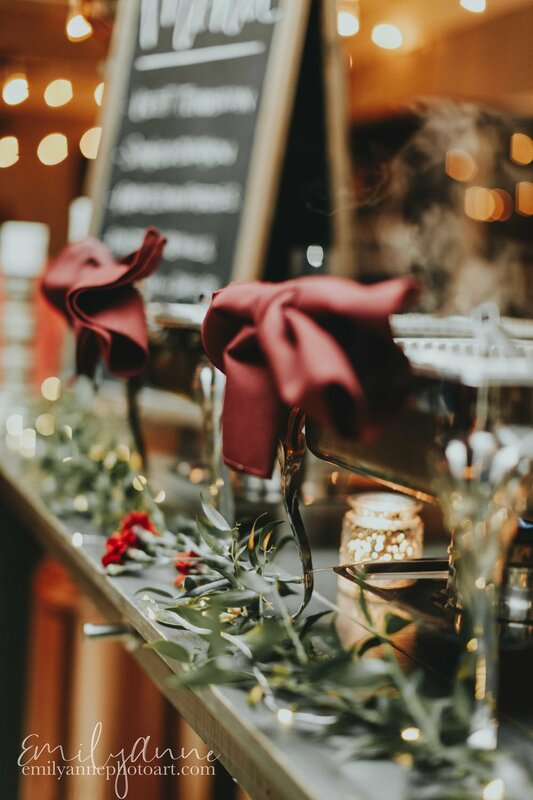 If you visit during the winter, there are plenty of coffee shops & cozy restaurants all along the plaza to keep you warm & cozy. Also, there are more chocolate shops than you can even imagine. Grand Plaza in Belgium is super beautiful & you must go and visit when you have the chance if you're there. However, of all of Belgium, I would say that my favorite city is probably Bruges, but next time I would love to see Ghent and Antwerp. Well, there you have it! There's a little tour of Belgium for ya and hope you enjoyed! Had the privilege of exploring this beautiful Library of Leuven Catholic University. If you are visiting Leuven, it is well worth it to stop by this gorgeous tower and take the audio guided tour in your preferred language of this historical landmark. You can also climb up to the tallest bell tower for a stunning view if the city of Leuven, especially at sunset- it is the perfect place for gorgeous photos - almost reminds me of Notre Dame. This beautiful library built in 1834 was burned by German soldiers at the beginning of the First World War and ever since has been restored bit by bit. If I lived here, I would certainly put this gorgeous natural light room filled with knowledge to use-- one of the most beautiful libraries I have seen. Ok, so what do you know about Belgium? Waffes, fries & chocolate. -- You're not wrong! Belgium is filled with these delicious things so if you have a sweet tooth & like chocolate it might be heaven or even a bit dangerous to go to Belgium. But what I am about to tell you about are 4 important reasons why you should give this country a chance. Brussels, Belgium and especially Leuven are majorly underrated compared to bigger cities in Europe like London, UK, Paris, France, Barcelona, Spain, Rome, Italy or Amsterdam in the Netherlands but it does have a lot to offer for less price. 1. Since Belgium is so small, it is very easy to get around. Public transportation such as the trains and metro stations run smoothly and on time. You can easily explore some of the best of Belgium in a small amount of time: Antwerp, Ghent, and Bruges, some of the biggest tourist attractions are all within 1 hour by train. Also Brussels was chosen as the location that hosts the official seats of the European Commission Union for a reason. This small little country is centrally located and is less than 4 hours train ride to all the main European cities including Amsterdam, London, Paris & many other parts of Germany and others. When you walk into a chocolate store, suddenly the most difficult decision you will ever have to make in your life, is which chocolates to pick! It is pure torture! Especially when you are in Belgium surrounded by Belgian chocolates! 3. Belgium, Leuven in particular is a brilliant blend of both German and Dutch culture. The best of both worlds. In Leuven, they speak Flemmish which sounds like a mixture of both German and Dutch & the architecture is very similar to homes in the Netherlands like in Amsterdam. And the people are so very friendly- everyone walks or bikes everywhere, are well dressed & smile and have a positive countenance as you walk down the street- a bit different than the culture in Barcelona where people are friendly but not "street friendly" you may say. Although it does get quite cold in the winters, I can absolutely see how this sweet town would be a lovely place to retire for elderly couples - it is so peaceful and honestly felt like I was in another world - maybe the world of Frozen for a day. 4. The street markets are fantastic. You can find both old & young at the street market in Leuven- not only fresh produce, cheeses, meats are available but also many different practical necessities - including mops being sold on the street haha. That was interesting! 5. The architecture is fantastic. For a small little town, Leuven has a lot to offer as far as visual sights go. The historic city town hall looks like THIS. Each street is so immaculate and unique in its own way - I can imagine shooting a gorgeous winter engagement session in the middle of these darling streets or photographing an elaborate classic wedding on the steps of the city hall and it would look FANTASTIC-- any takers!? One of the cutest gardening stores in all of Belgium - Dille & Kamille. I pretty much wanted to buy everything in that store but somehow my little Easy Jet backpack wouldn't permit it. What a super fun model photoshoot in the heart of Barcelona- otherwise known as Las Ramblas on a perfectly sunny day with beautiful Heloisa. Heloisa is absolutely stunning inside & out. Originally from Brazil, she moved here to Barcelona to study Spanish and work on business & design. She is extremely talented at all that she does & I cannot wait for what the future has in store for her as she continues to pursue her dreams. If you need any sort of business strategy/branding techniques- she's your gal!! One thing you won't find as much in Nashville as here in Barcelona is the tremendous amount of street art & graffiti. It really does photograph well though because it add more depth & dimension to the shots & that's one of the best things about Barcelona in my opinion- the street art. Heloisa, you are beautiful & I am so excited to see what you accomplish all in your future! Well, London. You might as well say that red is definitely its colour. :) Red phone booths, red buses, red accents on walls, royal guards in red... it really does suit the vibe of this intriguing place. Believe it or not, even if you have a layover in London for one day or only have a short stay in this top of the line city, it is very possible to see some of the biggest sites in a day. These giant double decker tour buses are most definitely the iconic "London" look. Almost everywhere you turn in London you'll find absolutely gorgeous architecture - it is a city filled with history and these old, magnificent cathedrals and churches you can find every few blocks throughout this gorgeous city- they are definitely fun to photograph. Can you imagine having a wedding inside -- or outside these crazy cathedrals? We walked down past Westminster abbey and were pleasantly surprised to find royal guards on horses standing their ground - so neat. :) Be warned - Big Ben is under construction and, just like the Sagrada Familia in Barcelona, it won't be completed for a while so it is almost unrecognizable right now and a bit disappointing. We took a stroll through Hyde Park on the way to Buckingham palace and met plenty of these little friends along the way. Hyde Park very much reminds me of the parks in London, Ontario Canada. We knew we had reached Buckingham Palace as soon as we saw these gorgeous golden gates glimmering in the sunshine. Again, if you do decide to see London, you can hit all these iconic points by walking, starting at Westminster, going to Buckingham Palace back across the bridge past St. James Park and crossing over onto the London Eye Bridge and over to the Natural History Museum by the fountains. What is a trip to London, UK without a picture inside a red phone booth!? Little Venice is a lovely little part of England further to the North! Absolutely gorgeous & there are lots of little shops to check out and brunch places- basically, London is the capital of brunch. Tenerife - what an absolutely beautiful and unique island. In case you didn't know, Tenerife is one of the 5 Canary Islands located 60 km off the coast of Africa and is a province of Spain. This rugged destination is the perfect place to relax and unwind walking on volcanic rock the deep Atlantic blue ocean seaside, walking beneath the gorgeous palm trees, or hiking up mountains and volcanic rock formations-- this island has it all. Not to mention, the perfect climate 60- 70 degrees and sunny year round - talk about the best of everything! One thing we did quickly learn is that, since this island is pretty small - public transportation is not always that reliable so I would 10/10 recommend renting a car for the time you stay. Such unique terrain- unlike anything I have seen before. Also, this island is a very popular European vacation hotspot for people from the UK - we saw many British people relaxing on the beach. 1. See the 1000 year-old Drago tree- The Millennium Drago is the multi-crowned king of Canarian flora and the best view of it is from Plaza de la Constitución. 2. Visit Masca- Setting eyes on Masca for the first time is like discovering a lost world tucked away in the creases of Tenerife's ancient Teno Mountains. 3. Swim in Garachico's rock pools- 1706 when an eruption sent two destructive molten rivers careening through the town to fill the harbour with lava instead of ships. Ironically, the event which nearly took the town off the map 300 years ago is now the reason people flock there. The pools are various depths and shapes; some are suitable for toddlers, as long as they don't mind mingling with sub-tropical fish, others require good lungs to reach the bottom. 4. Explore the Anaga - the right choice if you want to explore the beautiful area of Anaga - a UNESCO biosphere reserve. An excursion to Antequera Beach with this great team is one of our favourite things to do in Tenerife the right choice if you want to explore the beautiful area of Anaga - a UNESCO biosphere reserve. An excursion to Antequera Beach with this great team is one of our favourite things to do in Tenerife. 5. Hike the Teide- hiking in this gorgeous National Park is a real treat, excursions, visiting the Teide Observatory, Sunset and Stars on the peak, a visit to the Altavista del Teide Refuge and a cable car ride up the mountain. London really is as lovely as it sounds in a British accent- this city is truly the epitome of beauty, elegance, rich Roman history and architecture all in one place. We had so much fun exploring the city and YES we took advantage of these gorgeous classic old UK phone booths--- they are literally the best. Isn't she absolutely stunning!? Best model award goes to Meghan--- she's a natural in front and behind the camera. Westminister Abbey is absolutley stunning- we went on a cloudy day but finally the sun came through and reflected over the water beneath the London eye and it was priceless. I can hardly wait to see the Royal Wedding and where they end up taking their romantic wedding photos- wonder if they will choose some of the same locations?! We went to the London National History Museum and the London Victoria and Albert Museum and it was marvelous to see years of history, old civilizations from the ancient Chinese, to renaissance, to modern art - highly recommend!! :) One of my favorite exhibits was the TimeCapsule history of women's fashion throughout the last century - so interesting. Basically, we have VERY boring fashion now compared to earlier decades. From Barcelona - London is really only an hour flight away which is quite amazing but from the US, specifically from Nashville, it is quite the trek "across the pond." But this day in London was brilliant thanks to this lady! You would think that living in a Beach city, one would go to the beach all the time. However, I was completely wrong and it’s all about proximity. While I am relatively close to the beach from American standards and transportation, in Europe things such as city transportation take longer. Nonetheless I got put out and finally had the chance to snap some images of the gorgeous sun & Mediterranean Sea. Looking across the Mediterranean Sea feels different than looking at an ocean. When I stare across I can imagine the excitement of citizens who traveled and ended up in a paradise called Italy. We went to Brunch and Cake by the Sea. Super lovely! This was my first beet root lattes and it was certainly not my last. 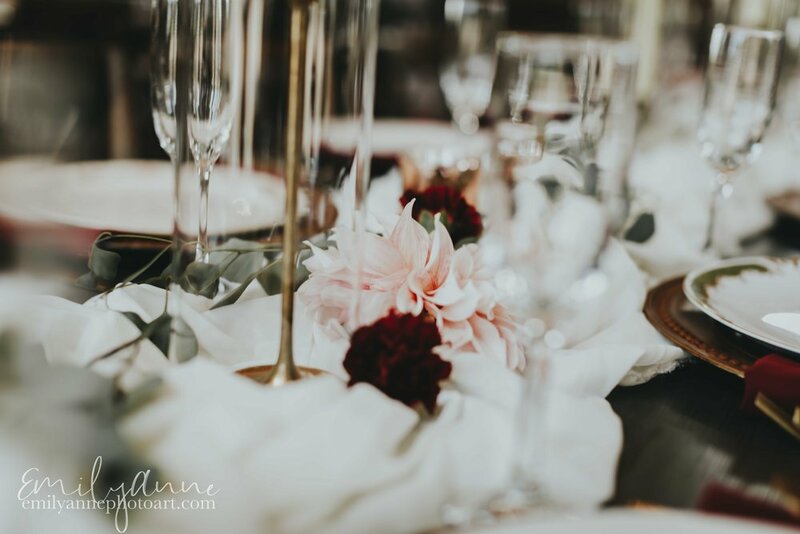 Beautiful floral designs welcomed guests into this lovely restaurant. Be warned, if you do go to the beach in Barceloneta or any of the beaches close to the Old Gothic Quarter you should be vigilant and prepared to prevent pick-pocketing by bringing very few pieces or wearing a wallet protector right on your body. Girona, beautiful Girona! Home of the Game of Thrones movie set (which I do not endorse by the way), the oldest Jewish Quarters in all of Spain and filled with rich history. In this beautiful town you can absolutely see the old medieval architecture but also later Roman influence. This city had been laid siege to over 20 times, so it has had its fair share of invasions. Girona now has another reason for the larger flux of tourim- Game of Thrones backdrop. However, personally the streets like these are ones that made me feel like I was waltzing through a romantic movie. "La muralla" the wall of Girona was built to protect this beloved city from invaders, but clearly it didn't work, due to the number of invasions! Nothing like finding fresh fruit in the markets on the streets of Girona on Las Ramblas de Llibertat. Girona is one of the most nationalistic cities that is 110% for the independence of Spain. Almost every street corner you turn, you will see either the Catalonian flag of independence or these ties on the windows, indicating the desire for separation from el gobierno de Espana. The Arab baths were one of my favorite findings in Girona! These Arab baths are Romanesque construction (12th century) inspired by Roman baths, its most outstanding elements include the entrance, which was used as a changing room and relaxation area and is covered with a barrel vault, and the cupola covering the central pool, which is supported by slim columns with gorgeously capitals. Very mysterious, are they not?! Of course we had to try the gelato made by the #1 best restaurant in the world for 2013 and 2014- El Celler de Can Roca. And it really was fantastic! We climbed up this old German barracks fortress to get this view of the city. Worth it! Located within the Força Vella, the Jewish Quarter or Call is one of the city's most emblematic areas. It consists of a labyrinth of narrow streets and patios that have maintained their medieval atmosphere. It is one of the best preserved Jewish quarters in the world and clear evidence of the importance of the Jewish culture in Girona. Thanks so much for taking the time to enjoy some of the journey with me! Hope you enjoyed & until next time! This weekend, had the privilege of traveling from Barcelona to the historic city of Girona, Spain. While in this gorgeous town that felt like a movie set--- if you would like to see the city click HERE --- we discovered one of the best coffeeshops in the world - Espresso Mafia. Not only is the coffee incredibly smooth and house roasted, but the shop is absolutely fantastic and biker friendly-- but really. Started by an amazing couple Christian and Amber Meier. Christian is a professional cyclist with a passion for coffee who decided to start this coffeeshop along with their other coffeeshop La Fabrica in the heart of Girona, Spain. Even with our brief time in Girona, we could instantly tell that Espresso Mafia was the place to be as 6 or 7 professional bikers stopped in for a fresh cup early in the morning. Not only is the decor absolutely fantastic, but the people are fantastic and make you feel right at home as soon as you walk in the door. Do yourself a favor and go try Espresso Mafia on your trip to the gorgeous city of Girona!